A 12:50 departure at Gatwick required a cab at the door of the Sherlock Holmes Hotel around 9:30 AM. We had figured that we needed to leave early as we had to factor in the time it would take for a cab ride to Victoria Station during somewhat of peak morning traffic and then taking the Gatwick Express Train to Gatwick Airport and we also had to factor in getting through Security at Gatwick South Terminal which we had previously experienced could take quite some time! However, first we had to have the famous Sherlock Holmes breakfast which was included in our room rate. We were down to the dining room by 7:30 AM which is very early for us and we had a fantastic Full English Breakfast as the Brits like to call it! The best ever eggs any way you wanted them, beans, sausages, blood pudding, bacon, fresh fruit, cereals, freshly squeezed orange juice, cranberry juice, apple juice, cold cuts of all kinds, lovely toast, bagels, muffins, tea, fresh brewed coffee and it goes on! 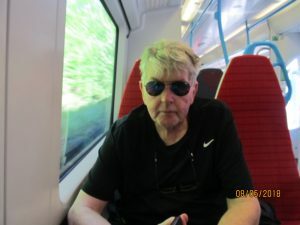 Hubby particularly liked the smoked salmon which he loves dearly! So Hubby was in heaven with this spread! 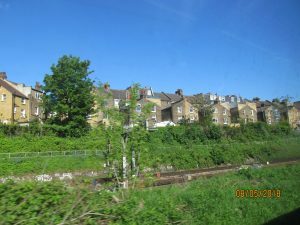 On the Way To Gatwick Airport on the Gatwick Express! Our cab was at the door on time thanks to the Concierge and the ride to Victoria Station was amazingly quick. Very little traffic on this day! 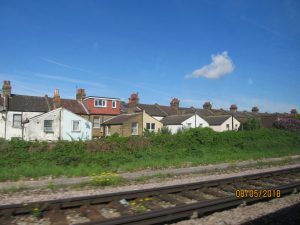 The Gatwick Express Train to Gatwick Airport had no delays, again unusual, and security was not very busy either this time. We were pleasantly surprised! We cleared Security by 11:40 AM with enough time to have a snack with beer and wine compliments of Priority Express which if you are travelling you should avail of for sure. You can buy this convenience which gives you four free entries into their lounges or sponsored restaurants at airports across the world. Four visits constitutes two visits if you have a partner travelling with you. Air Miles offers this through ONYX and CIBC here in Canada is also offering now Priority Pass with their Adventura Credit Card. Same number of visits allowed free four per card holder. If you go over your allotted visits you can still enter the lounges or restaurants with your Priority Pass Card but you will be dinged for each person in US $. A good convenience though if you travel a lot. 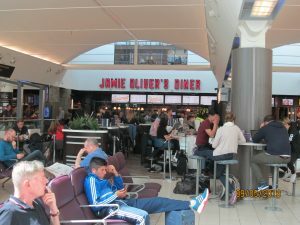 You don’t have to sit in the airport in the chairs for extended periods of time while waiting for your flight! 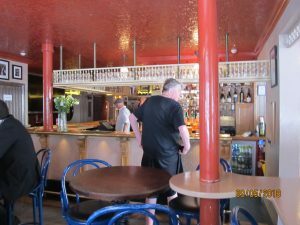 The lounges offer more than food, they also have big screen TV’s and staff who can help you with other needs if you have them. More Pics from the airport and on the Journey to Gatwick Airport! We boarded BA2680 on time. British Airways departs the South Terminal which has many more amenities , shops, restaurants, Duty Free etc, than you will find in the North Terminal at Gatwick Airport where West Jet lands and departs! It is also much more modern than the North Terminal. You can see your departing flight listed on the huge terminal electronic boards but your gate will not be posted for inside of 30 minutes of departure. So you have to be on your toes if your gate is at the far end of the terminal. 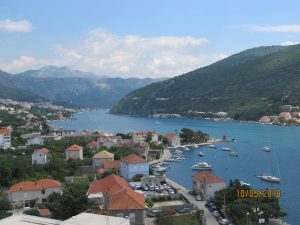 Our flight was 2 hours and 45 minutes to Dubrovnik Croatia and we were scheduled to arrive at 4:35 PM local time. Hubby had paid a little extra for leg room and it was worth it, so he felt. 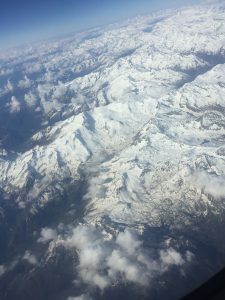 Our flight path offers some spectacular views of the Alps, which we had planned to explore later in our vacation. 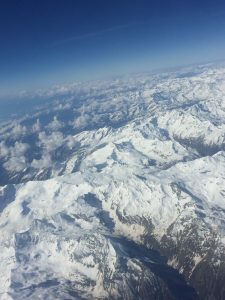 Views of the Swiss Alps From 30,000 Feet! We arrived on time. 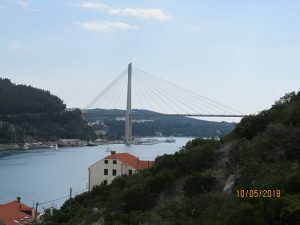 Dubrovnik Airport is 16 KM from Dubrovnik City Centre and 20 KM from our booked accommodation in Mokosica. 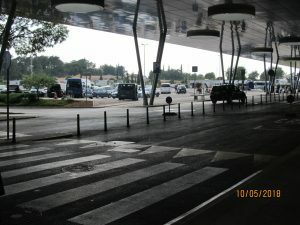 The Dubrovnik Airport has a new terminal opened in 2010, but a newer terminal is planned. The airport handled 2.3 million passengers in 2017, and in excess of 45 different airlines use the airport as a landing destination. 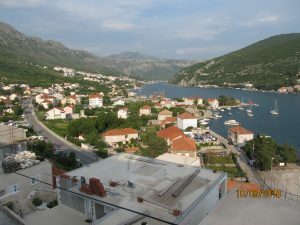 Croatia is now a major tourism destination. 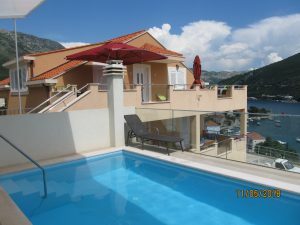 Daniela’s Rental in Mokosica: Just outside of Dubrovnik! What a Beautiful Place! We cleared Customs at 5:30 PM. We had arranged for a driver to pick us up and deliver us to our accommodation in Mokosica. This we accomplished through AIRBNB and hostess Daniela in Mokosica who we booked online. 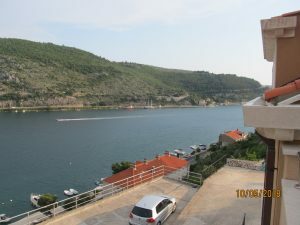 She has a very nice cluster of apartments on the hillside overlooking a beautiful bay. Based on the information provided and photos, we thought we couldn’t go wrong. 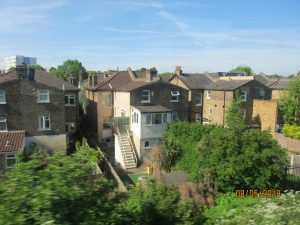 There were also some very good testimonials to her and the apartments that she was renting on AIRBNB. 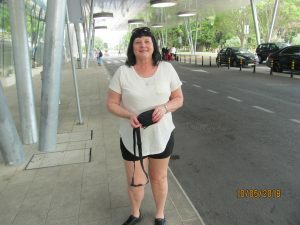 We also felt that the rate she was charging per night was reasonable at $130.00 Canadian per night for an apartment plus access to a pool, we decided to book with Daniela. We were not disappointed! The pictures were just as posted and Daniela was an exceptional hostess! 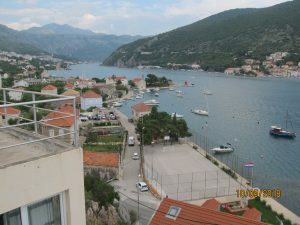 Outside the Mokosica Apartment and Views of the Spectacular Bay! Our driver was waiting for us. He was very friendly and provided lots of good information on Croatia and Dubrovnik specifically. The scenery on our drive was spectacular. 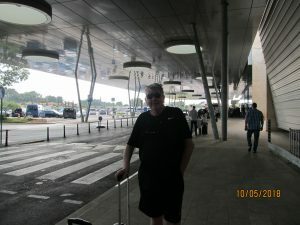 Our taxi fare was 250 Kunas, around $50.00 Canadian and reasonable we thought given the distance from the airport. 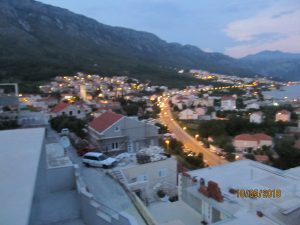 After a few telephone calls to Daniela, the driver delivered us right to the apartment which I might say would be hard to find if you didn’t know where you were going. 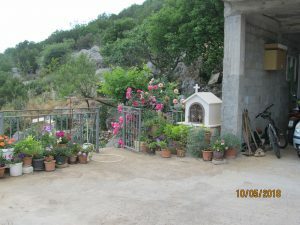 It was located on the side of a hill up some very steep roadways and narrow oneway lanes! But safely delivered we were! We arrived around 6:30 PM. Daniela was not there to to meet us but sent one of her friends that worked for her with the keys. She was delightful and showed us around the apartment and answered any questions we had. We weren’t disappointed! 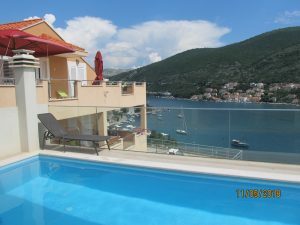 We had all the basics plus a great private patio overlooking Rijeka Dubrovaka Bay and what a view overlooking the bay! Astounding for sure! Next up we had to get some supplies for our stay, enough for four days! The girl who checked us in told us she would arrange a driver to pick us up at a market which was a 20 minute walk, all downhill fortunately. More Scenic Pictures of Rijeka Dubrovaka Bay! We walked down the side of the hill down many steps and found the markets no problem. You could actually see them from the patio of the apartment! The currency in Croatia is the Kuna. Its value is five times the Canadian dollar. So anything priced in Kunas, we decided by five to get an approximation of the price in Canadian $. Therefore a 20 Kunas bottle of wine was a good price indeed at $4.oo Canadian. I must say though the most expensive item we purchased in Mokosica was our favourite, a bottle of Gin. It was scarce and outrageously priced. We purchased our Kunas online before leaving Canada from our bank. Very simple process and quick and efficient! Views Down the Hill Where walked to get our Supplies! Having purchased our supplies, several bags worth, we waited for our driver to show. Unfortunately he was a no show. It was some sort of communication problem we learned later. No taxis about either, so we had to hike it back up the hillside to get back to the apartment! We climbed 80 steps plus up on an old stone set of stairs. Quite challenging for sure! We would later discover a better set of steps nearer the apartment once we settled in! Needless to say we were breathless at the top of the stairs coming up from the street to the mountainside! Anyway we can still cut it and managed to smile and wave at the old people who thought we were nuts on the way up the stairs to the apartment complex! Yes there were more steps to navigate to get to the apartment! It was mission accomplished! We were too tired to go out again and it was now close to 9:00 PM and very dark. So we decided to have a meal from what we had purchased at the market. Around 10:00 PM, a knock came on our apartment door and there was Daniela with her little boy! She had come to meet us and give us more information on Mokosica and Dubrovnik. She came bearing gifts as well. She had homemade bread, meats, cheeses, and a large carafe of red wine made by her husband! She was all apologetic for her driver not connecting with us earlier. No problem, we all had a glass of wine together. Daniela turned out to be a very lovely lady, friendly, outgoing and quite outstanding as a hostess! A real entrepreneur for sure! We agreed her driver would take us over to Dubrovnik the next afternoon, and we bid her and her son goodnight! Daniela was like no one we’ve ever met before on our travels as a hostess of her apartment complex! 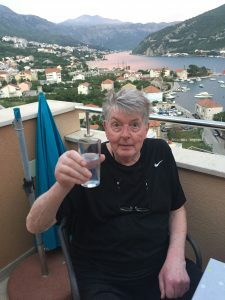 Hubby Enjoying a Gin & Tonic on the Private Patio in Mokosica! A very lovely evening on the patio, very private and it was a very nice warm evening with a slight breeze off the bay. 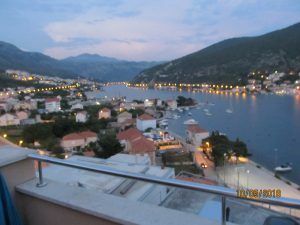 We enjoyed the twinkling lights on the hillsides surrounding us and the beautiful bay below. 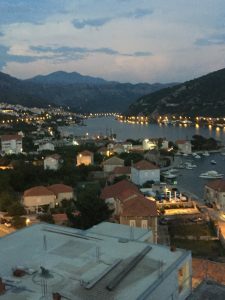 A great start to our Croatia adventure! We were very tired after a long day and after a night cap we slid under the sheets for a very good nights sleep! 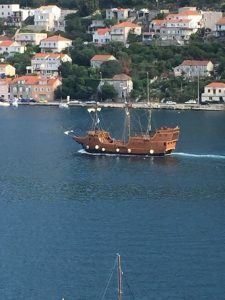 Tomorrow would be a new experience exploring Mokosica and Dubrovnik!